With the SharePoint app for process management you can depict processes, organization structures and resources within a context. We also help you to design, recognize, connect and analyze organizational relationships, define responsibilities and make this organizational knowledge available for everyone in the company. 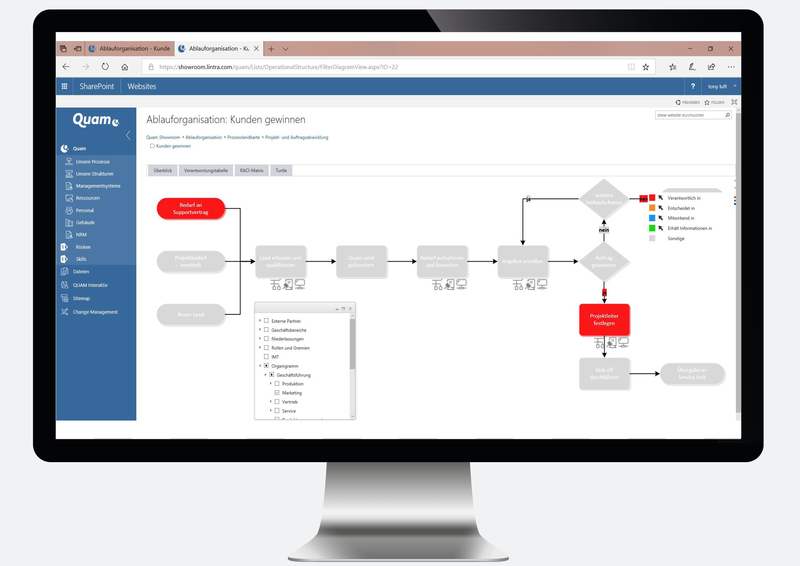 With Quam a new organization information system will arise as a basis for analyzing, optimizing and automatizing processes and structures – as a team and beyond organizational boundaries.Your employees will be able to understand the company a lot better and optimize processes together with you. 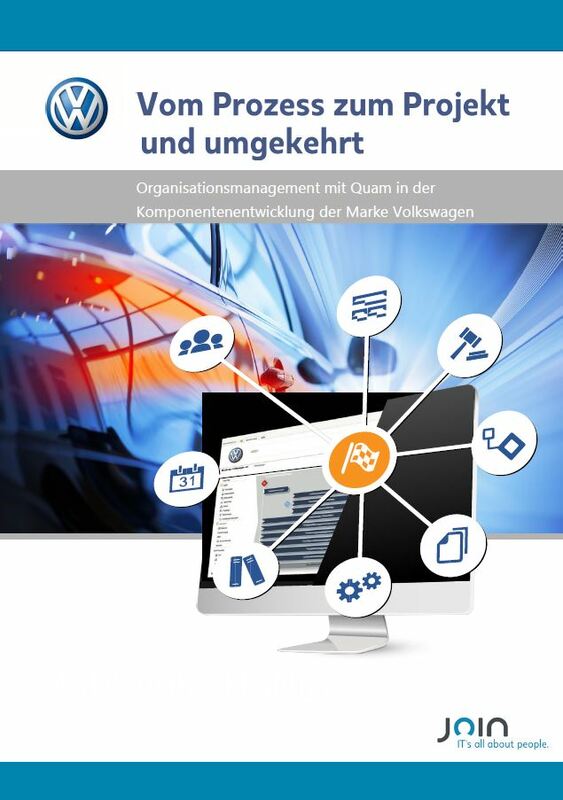 Quam stands for the words Qualitätsmanagement (quality management), Umweltmanagement (environment management), Arbeitssicherheit (occupational safety) and Managementrichtlinien. Quam analyzes the organization and logically links elements of the organizational and operational structure via a defined process. 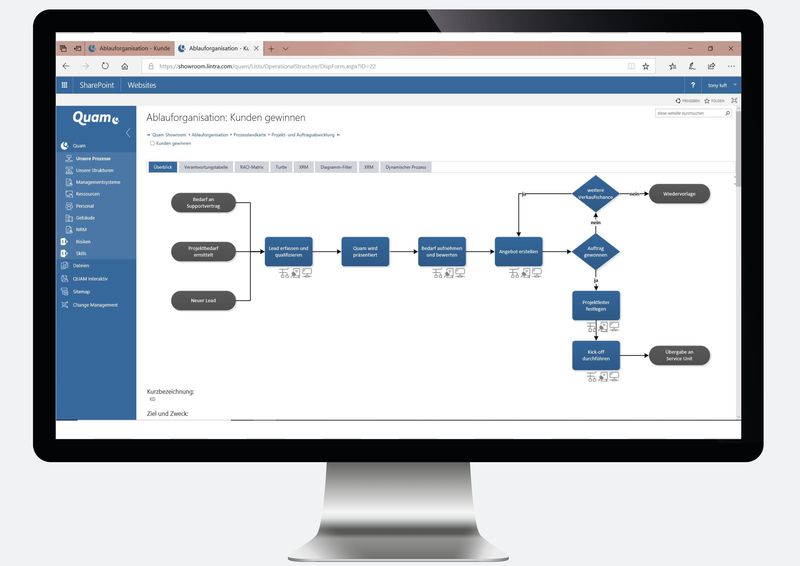 This way process maps, organization charts as well as views of rolls, functions and organizations are available for all employees at all times, whether as hybrid solutions or directly in Microsoft Azure. The SharePoint app for process management raises your organization to the new level 4.0. With your personal account you can log in to our SharePoint demo system and test the full functionality of Quam for process management. Enjoy! Quam analyzes the organization and logically links elements of the structure and process organization via a defined process. Process maps, organizational charts, role, function and organizational views are available to all employees at all times. Quam is available for SharePoint on Premise, as a hybrid solution, via Office365 or directly in the Microsoft Azure Cloud. This SharePoint app elevates your organization to level 4.0. 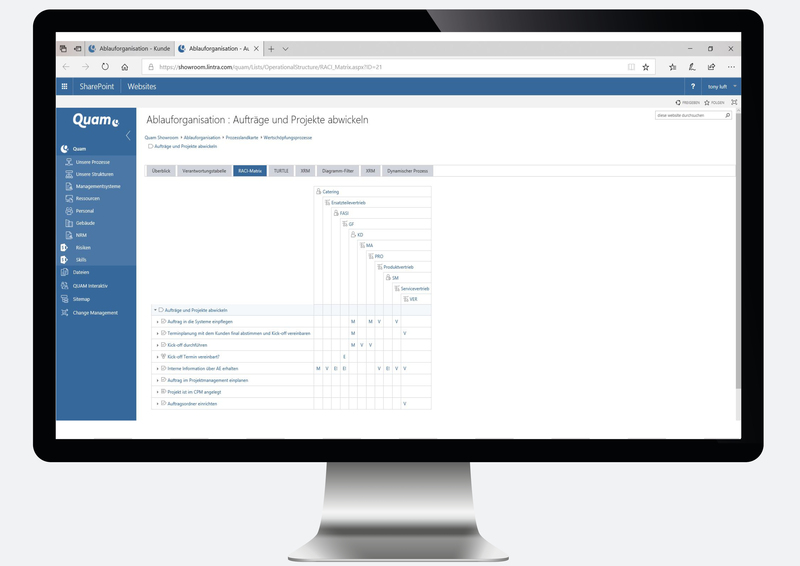 The depiction of the whole organizational structure takes place on multiple levels: registrate organization charts, organizational areas, as well as buildings, departments, IT-systems, personnel and even the homepage of each employee. The logical evaluation of functional dependencies show the direct reference to modelled processes. Thanks to intelligent links between organizational and operational structure, graphics become interactive and support the life of the processes in the company. Quam collects, structures and organizes people, forms, IT or information along the processes. This makes for a basis not only for automatically generated and updated job descriptions, but also for evaluations of usage authorisations in IT-systems or the usage of documents in processes. Management guides and procedure instructions document your organisation by different points of view. If you want to provide subject-related documentation for different recipient-groups, for example employees or auditors, use the possibility of a data base and document rules without redundancies and with minimal effort. With Collaborative Document Control (CDC) Word documents can be managed directly in Quam and can automatically be made to be available as a HTML-preview and as a ready to print PDF file. Quam belongs to the product family of Lintra plus GmbH. Lintra concentrates on the continuous development of the Quam while we, as partners, deal with the topics of process management and organizational development in all their diversity and breadth.